Once again BWM Rally was a huge success with all concerned, I would like to take this opportunity to thank all those scooter clubs that worked so hard behind the scenes, also to all our rally goers that have turned up and made this rally such a great event. Even though the weather was not too kind to us this did not stop all the bands & acts playing great sets on the Main Stage as well as Olas Boss & Ricky Ticks entertaining all those in the two marquees. Also the Misdemeanours SC DJ's done us proud all weekend in Fuelers bar. We are already in planning for 2016 and hope to release the date for 2016 very soon. Featuring Live Bands and DJs, Custom Show, Run What Ya Brung, Ride Out, Club Camping, Jet Car, Fun Fair Rides & Amusements, Traders, Caterers and much more all on the one site at Santa Pod Raceway in Northamptonshire. The event for Scooterists, Mods, Skinheads, Casuals and Ska fans. In association with BWM Scooter Ska Rally 2015. Misdemeanors SC Lowestoft will be attending the BWM Rally with club members playing the very best in Ska, Northern Soul and all your favourite scooterist sounds in the Fuelers Bar. More details on our Facebook page. Main Stage, Reggae Tent and Ricky Tick Tent. Live entertainment across multiple music zones with Live Bands; Bad Manners, The Soft Tone Needles, Heavy Sol, The 2 Tones, So77 plus the Ricky Tick DJ's and OLAS BOSS Upsetter Sound System with special guest DJ's. Fuelers Bar will also play host to Misdemeanour DJ's playing Ska, Northern Soul and an array of scooterist sounds. Details of the music line-up on the Music page. The dragstrip will be open on Saturday and Sunday for you to take your own scooter down the track and race your mates, you will also get a performance print out! This is the cheapest track time in the UK - Only £25 for unlimited runs. If you have a provisional licence that will cover you to ride your scooter on the road, you can ride it on the track. Details on the RWYB page. Got a sweet ride, want to show it off and be in with the chance of taking home a trophy? Enter the FREE Custom Show and who know, you may be a winner! Camping is included with all tickets bought in advance or on the gate (number of nights camping included depends on your ticket type), you can bring your own alcohol (as long as it is not in glass bottles) and also your own disposible BBQ's. As well as General Camping there is also a Quiet Camping area with strict noise curfews (Please ask for a pass at the gate if you wish to go into Quiet Camping). Campers and Caravans are welcome although electrical hook-ups are not provided. If you prefer comfort and mod cons then there is a list of local hotels at www.santapod.com. Gates close at 5pm on Sunday. Further camping facilities are available at Billing Aquadrome, 20 minutes drive away from Santa Pod Raceway. Pitches from £12 per night, Tel 01604 784948. The first clubs to book for BWM Scooter Ska Rally will have their names added to the Scooter Clubs page, so get your bookings in and represent your club. Scooter Clubs can book their own Club Camping area in advance. You will need at least ten vehicles to book club camping, if so please return a completed booking form to Donna and phone the office to bulk buy your admission tickets. Club offer - Buy 10 tickets get 1 free* in advance when ordered over the phone. Club display areas can also be booked for clubs just coming for Sunday. View this years Supported Club here. A variety of traders and exhibitors will have stands in the Dealers Market and there will also be an Auto Jumble for second hand parts. Trade Stands / pop up shop prices start from £75 Plus vat for the weekend includes 4.5 m frontage and two passes. Call Charlie on 01234 782828. Visit the Exhibitors page to download a Exhibitor Pack and Booking Form. This is done on a first come first served basis. Simply pitch up in the Autojumble section as specified on the site map. BWM Scooter Ska Rally are proud to announce that the 'Ride Out' on Saturday will be raising money to go towards the Help For Heroes Charity, to join the Ride Out please visit the Help For Heroes pop-up shop to make a donation and receive a H4H Wrist Band and additional details. A pre-ride briefing will take place at 10am in Fuelers Bar where the itinerary and safety aspects will be provided. There will be a Help For Heroes bike and discreet police presence during the ride out to ensure all goes smoothly. Ride Out led by Doughboys SC and runs for approx 8 miles to Grendon Lakes with plenty off space to park for a quick coffee at the Cafe Club House then return. New to BWM Scooter Ska Rally for 2015 is the Moto Gymkhana. A high energy, technical scooter and motorcycle sport that doesn’t take itself too seriously! It’s all about skill – requiring accurate control, bursts of speed and ruthless braking – rider ability not horsepower is the key to steering round a course of obstacles in the fastest time. You can take part on any kind of motorbike and learn some great techniques to help you speed up your slalom, get a rapid rotation and accelerate your X-box! Why not give it a go? The 10,000bhp Fireforce 5 Jet Dragster will be running on the dragstrip on the Saturday of the show. Check out a clip of the Fireforce 3 Jet Funny Car at BWM Rally 2014 HERE. 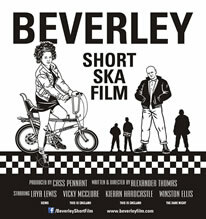 NEW to BWM Rally we will be showing short film Beverly, view show times via the Timetable page. UK filmmakers Urban Edge Films unite a host of British talent in gritty, stylish coming-of-age story, BEVERLEY. Skins actress Laya Lewis makes an impressive performance as a troubled teenage rude girl of mixed-race identity seeking respect within a gang of male skinhead youths on a white suburban estate -1980 Leicester. But it’s not just her own sense of self she needs to worry about – it’s her brother and sister too. A familiar enemy is ever present - a threat that extends beyond her own safety. UK Top Sportsman is a no rules class of racing open to vehicles that run under 10 seconds on the ¼ mile. The weekend consists of heads up racing one day and bracket racing on the other so choose your favourite and cheer them on till the end! Fairground fun with dodgems, arcades, waltzers and more. There multiple bars and a range of caterers on site at Santa Pod Raceway. The main bar will be open from 12pm - 12am with music and karaoke (timings for Fueler's Bar can be found on the Music page). BWM Scooter Ska Rally will be held at Santa Pod Raceway, the UK's premier Drag Strip in the heart of England on the border of Northamptonshire and Bedfordshire. For full venue details please visit www.santapod.com. The shuttle bus which operated in previous years will not be running for 2015. Taxis are readily available from Wellingborough Train Station. ©2015 BWM Scooter Ska Rally. All Rights Reserved.